Way back in January, while recovering from my de-boobing surgery and trying to get my head around the months of cancer treatment that were lining up on my doorstep, I found myself making lots of lists. Lists of potential side effects, lists of products I needed to buy, lists of things to avoid on chemo and lists of emergency supplies I needed by my bedside night and day. In amongst all that scary prep work, I vividly remember trying to push through the heavy folds of despair by seeking out little silver linings amongst what felt like piles and piles of awfulness. I optimistically set out to tally up a list of chemo ‘Pros’ to sit alongside all the ‘Cons’, in the hope it would make my head and heart feel a little lighter. It was clearly going to be all about the hair. 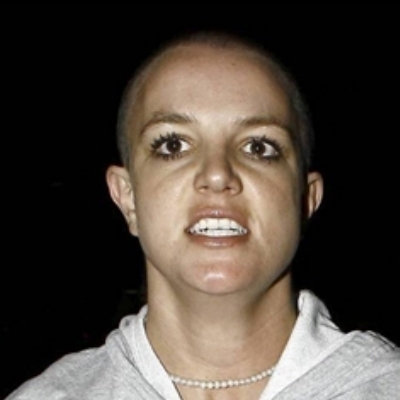 While I wasn’t all that keen on going bald, a small part of me had always had an inner desire to suddenly ‘do a Britney’ and shave my head. It’s not something I ever ended up pursuing, but I’ll admit to coming close a few times. In the end I would always chicken out. While it was a bold, brave move, it never really paid off for her, did it? Anyway, finally I had my chance! Cancer had provided me with not only the opportunity, but the necessity to buzz cut. Perhaps it’ll be liberating, I thought. Take back follicular control. Embrace the bald. I actually didn’t mind my initial buzz cut. It made me feel tough. I didn’t look sick, I just looked a little military. But very quickly, the fine crop of hair adorning my scalp vanished completely, winter descended, and suddenly having a head as shiny and smooth as a billiard ball was not only über unattractive, it was freezing. For the better part of six months I was completely bald up top, and sporting a ‘whole-body Brazilian’ everywhere else too. Who needs regular treatments at the beauty parlour when chemo can keep you looking silky smooth and fabulous for free? One little infusion date with some cytotoxic cocktails was all it took for my body hair to start sliding painlessly from their follicles. No need whatsoever for hot wax or zappy lasers! 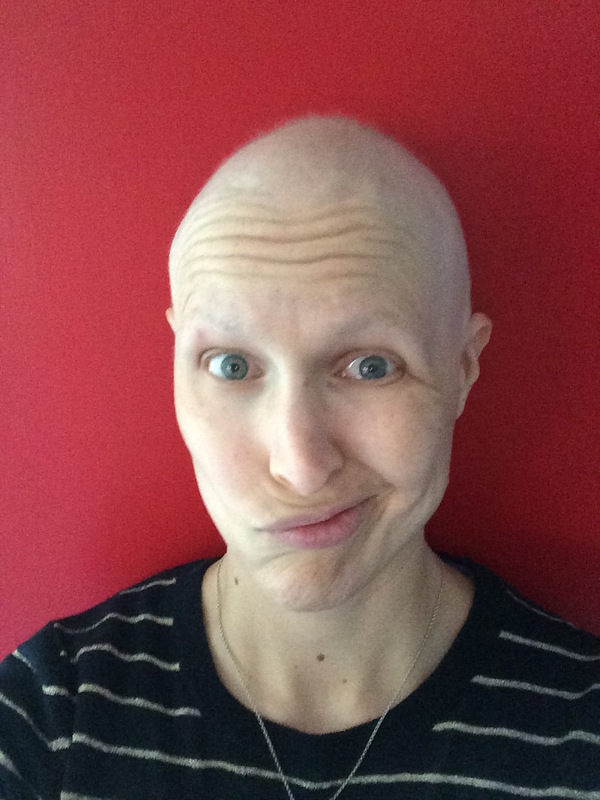 But while a bit of neck-down alopecia may seem like something to celebrate, when it encompasses eyebrows, eyelashes and head hair too, and you find yourself looking like a pale, pre-pubescent alien, there isn’t all that much to rejoice in! 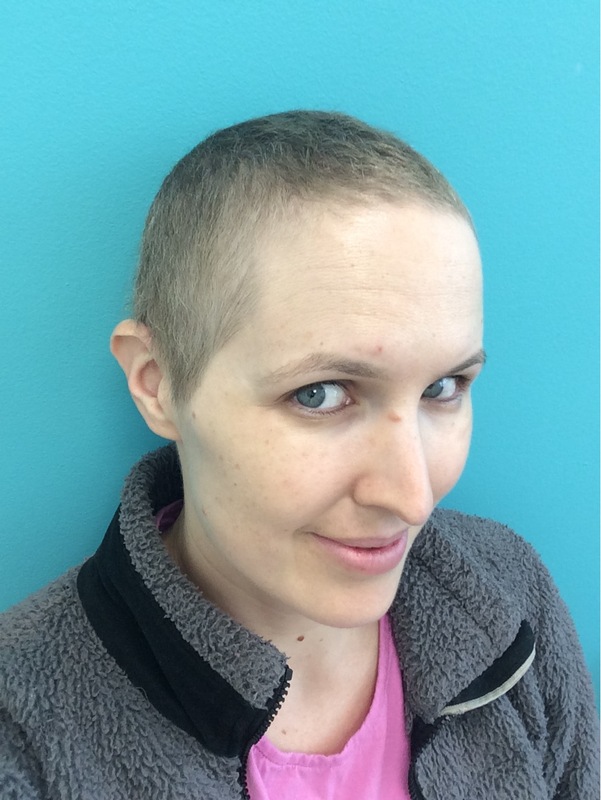 My kids were quite fascinated with my hair-loss too, and it was certainly the topic of some wacky conversations in our shower. It made me dig deep into the essence of who I was and reflect with them on what it is about each of us that really counts. I learnt a lot from their ability to embrace this new version of their mum so easily, and tackle questions from other children with a frankness that many adults couldn’t replicate. These days, my head is back to having a pretty good coverage of thick, short fuzz which could possibly pass for an army issue buzz-cut of sorts, although I can tell by the weird glances I still get from other people’s kids, that I’m not quite there. Young children will be the true test for me. When they stop ogling, I know I’m starting to blend into the normal crowd again! While head hair seems to grow slowly but surely, a new collection of chin hairs are going great guns. You know the type I’m talking about – the thick, dark, coarse ones that you’re positively sure weren’t around yesterday but have somehow sprouted two inches overnight, and are able to resist the death grip of a pair of tweezers with amazing tenacity? I don’t know whether it’s because I have become so accustomed to the hair-free version of myself this year, or whether it’s the hormone suppressants I’ve just started taking and my new menopausal status, but I seem to be cultivating quite a collection these days. I suppose after bemoaning my bald face so regularly over the last six months, writing odes to eyebrows and hoping for my lashes to grow back lickety-split, I should be embracing this new foray into facial hair with the humour and nonchalance it deserves. After all, it is just hair! Now, please excuse me while I go crop-dust my chin. And now to business … the chin hairs … after my eyelashes started to reappear I noticed the joy of chin hairs popping back. And they haven’t stopped it’s as if they wanted back in more than anything else. A friend says I can spot them from across a room, he is right! Oh my god! Five! There are five new ones this morning! Hahaha! The chin hairs. Well, for me, those were the last hairs to fall off during chemo and the first ones to grow back after chemo. I got used to having no hair on my body and got used to the bald look too. Weird, but I stopped using the wig after my third infusion. Interesting how we adjust to things in life. Now I keep my hair short. Why is that always the case?!?! The ones we don’t care for are the ones which hang around the longest!